It's no secret that we at PST are fans of Andy Tauer. In person he's charming; he's also an extremely talented artist with an array of beautiful scents. Carillon pour un Ange is his ode to Lily of the Valley, one of my personal favorite smells and one that can go so very wrong in perfume. When it's right (Diorissimo, CdeG Leaves) it can be a transportive dream. 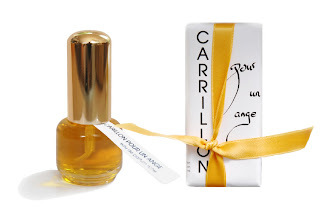 Carillon does plays with the angelic lily of the valley and it's clean hyacinth and orange innocence by introducing a shockingly sensual oily leather aspect to it that reminded me immediately of his (sadly) never produced Hyacinth and a Mechanic. I'm not the first person who's written that, as a matter of fact I believe he admitted as such to March at Perfume Posse. Unlike that hyacinth scent, this doesn't radiate. There's a yin and yang of the soft and sparkling flowers set against the dark and brooding leather and ambergris- it's not hard to believe that this was originally called "Gabriel" when in development. It's great to see a perfumer "spread his wings" in this way. Andy Tauer seems with each new fragrance to manage to both pare down yet broaden his reach. This might possibly be his best yet. Luckyscent is giving away bottles of this delight to two of our readers. To be included in the draw, please leave a comment. At this time we are only able to offer this giveaway to readers with US addresses. The draw will be open until Midnight on Sunday July 25th, Pacific Time. The draw is closed. Andy has also partnered with Luckyscent to do an ebook for charity called "A Moment With Lily of the Valley" in which all of us are invited to participate. Throw my name in the hat. Very fond of Andy Tauer's work. Been enjoying a lot of L'ADM lately. Oh I'd love to be entered into the draw. Andy is always so generous! I love Andy's perfumes too! "This might possibly be his best yet"
Realllyy?? Oh my God!- then I must smell this! I'm also an Andy fan. I would love to be entered into the draw! Thanks! I'm an Andy Tauer fan, and love Vetiver Dance. This fragrance sounds gorgeous! I would love to smell (and own!) Andy's latest creation so please enter me in the draw. LuckyScent is really pushing this one! Please enter me in the draw , I would love to win this very much. I adore URC and am anxiously waiting for URV. This would hold me over till Oct. Trying my luck here, too, in the hope that I can try this. Thanks! I am really looking forward to sniffing this one -- I love Andy's perfumes! What a nice review of what promises to be another interesting Tauer scent; the idea of leather and ambergris with LOTV is so intriguing. Please enter me in the draw and thanks to you all at PST, to Andy, and LuckyScent. I already have a bottle of Carillon so there's no need to enter me into the draw. I'm still trying to decide if I like it...well, I like it...not sure how much. The fragrance sounds so interesting! Thanks for offering the draw, Marina and Andy! Please pick me! I am a big Tauer fan and can't wait to try this one. thanks for the opportunity! Please enter me in the drawing...Andy is wonderful and very generous! Oh, please enter me. I've grown so fond of Andy from reading his blog -- I feel like he's a friend. Sounds lovely! Lily (otv) and leather: how can I go wrong? Will try for a bottle, anyway. Missing you. . . .
Just reading about this new release recently got the 'lemmings' all riled up. Many thanks to you and Andy for this exciting opportunity! Ooh! I would like to be included in the drawing please! Trying my luck here! My sample of this was beautiful. lily of the valley, what's not to love? thanks for the chance! I'd love to be entered in the draw, thanks Marina! Would love to be entered in the draw. Thanks for hosting this competition! Another Andy fan here...I would love to be in the draw! I'd love to win this one. Please enter my name in the draw. Please count me in the draw, too. I've been following this perfume's creation and am anxious to try it! I also want to be in that hat! Thanks! Andy is amazing, so please put my name in for the drawing! Please include my name in the draw! thanks to PST and Andy for holding another draw! Oh, I love Andy Tauer. Please include me in the drawing. Andy graciously sent me a sample of Gabriel while it was in development but I have yet to smell his final formula. I would be honored to win Andy's newest creation! Thank you Tom for this opportunity! it's wonderful to see this outpouring for Andy as well. Can I try my luck in two places? Another AT fan here, who has trouble spending so much on bottles! Please enter me in the draw. Sigh, we obviously need more Canadian perfume bloggers. Still, it's nice to lay claim to Ayala Moriel and the Perfume Shoppe.... and thank goodness Andy offers free shipping worldwide on his samples. He's so generous! I love Tauer's Lonestar Memories. Whatever else anyone says, the stuff smells EXACTLY like wisteria in bloom in May, northeast Georgia. This sounds like a wonderful scent, I'd love to try it! Please enter me into the contest! I'm a huge fan of L'ADDM, the less universally loved LM, and many of Andy's other creations. I can't wait to try this one. Please enter me in the draw! oh,hells yeah! please enter me in the draw...the eyes grow heavy and the mouth drools! Please enter me in the draw... would love to win a full bottle of anything Tauer! Please enter me too. Andy's perfumes are wonderful and a floral/leather is too hard to pass up. Oh please please please enter me in the draw! I've been in love with Andy Tauer since the first time I sniffed L'Air du Desert Marocain...! Would love to be included in the draw - thank you! A fragrance titled "Hyacinth and a Mechanic" makes me smile. Interesting juxtaposition. I would love to be included in the giveaway :-) Thanks! I have always loved the smell of Lily of the Valley flowers! One of my all time favorite flowers. Amazing how small a flower can have such a huge smell. Please add me to the drawing. Thinking of digging up some of my Lily of the Valley plants, as they have taken over my side yard.Yet...can't quite make myself eliminate any of them. wish the flowers stuck around a little longer--LOVE the scent,fleeting though it may be. Would love to get lucky in a drawing for something that sounds wonderful. Tauer fragrances always walk a line between integration and tension that makes them exciting to wear (for me anyway). This one sounds like it will not fail to register on the "exciting to wear" meter. Please throw my name in too. I'm so curious about this! Please enter me. Thanks! Yes, I would like to get in this draw. Thank you. Please enter me into your draw! Thanks! Please enter me in the draw. I would love love love to win this. I live in the US. Thanks so much! My sample of this is all used up and I would love a bottle- please enter my name in the draw! I love lily of the valley and can't wait to try this. Leather and lilly of the valley? Sign me up! And thanks for the opportunity! Please enter me in the draw! Anything from Andy is a MUST TRY. Ohhhhhh pleaseeeeeeeeeeeeee enter me in the draw :) I smelled it and its divine. I would love to own this gorgeous creation. I would love to be entered into your drawing. Thank you! Please enter me in the draw! I Would love this!It sounds gorgeous! this sounds beautiful. Please enter me in the draw. Thanks for your review. Lily of the Valley is just about my favorite top note. Please enter me in the draw too! Please enter me - I love Andy's work!! I'd love to sniff this one, please enter me in the drawing. Please enter me into the draw. I want to smell gorgeous! Yes! Please enter me! Thanks so much for hosting the draw. I am so looking forward to sniffing this one. Please enter me as well. I'd love to win this one, I love Andy so please enter my name in the draw. Please enter my name in the draw. I'd love to win this one. Please enter my name in the drawing - this sounds delightful! This fragrance sounds so interesting. Would love to be entered to win! Thank you. please include me in the draw , I'm really lemming this one ! please include me in the draw! props to vetiver extraordinaire! Please enter my name in the draw, thanks for this Andy, you are the best!!! I still have yet to try any of Andy Tauer's fragrances. This sounds beautiful. Please enter me in the draw. I'd love to try this; very generous of Andy and Luckyscent. would love to win this, thank you.